*The information here is for entertainment only and should not be construed as medical advice. If you’re ok, check on other passengers and drivers involved in the accident. If necessary, call the police to report the accident. Get help for anyone needing medical attention. Exchange insurance information and call your insurance company. Talk to any witnesses of the accident and get their contact information. Get medical treatment for yourself if needed and record this treatment with pictures of your injuries. Consider hiring an accident attorney if you feel you might not be compensated fairly. Consultations are free. 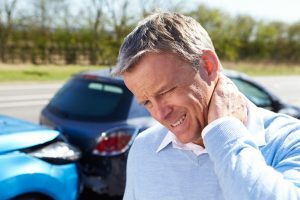 Whiplash is strain to your neck usually caused by force or impact that makes your head jerk back and forth or side to side. It is most commonly associated with auto injuries. Below are 5 signs that you might have whiplash. 1. You can’t move your head as much; your range of motion involving your head and neck has decreased. 2. It hurts to move your head from side to side or front to back. 3. You develop headaches that start at the base of your head or radiate upwards from your neck. 4. The muscles of your neck feel especially tight. 5. Your neck muscles are tender to the touch.